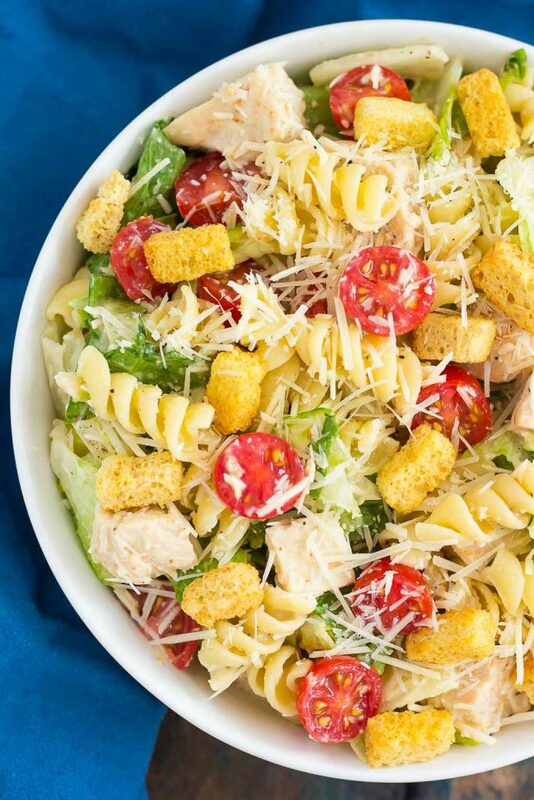 This Chicken Caesar Pasta Salad is a simple dish that’s ready in less than 30 minutes. Romaine lettuce, fresh pasta, chicken, and Parmesan cheese are tossed in a creamy caesar dressing that’s full of flavor. Light, yet filling, this easy dish makes a delicious weeknight meal! Not only are we into the first week of July already, but it’s also 30 minute Thursday! I think it’s safe to say that this is my favorite Thursday of every month. I mean, delicious, hearty and filling meals that are ready in just 30 minutes? Sign me up! Since the weather is warm and I’m trying to soak up all of that daylight, easy, fresh meals are the name of my game. And nothing screams summer more than a light salad. Specifically, one that takes just minutes to prepare and is full of flavor. Am I right? Caesar salads just happen to be a favorite of mine. It’s no secret that I love a variety of salads and could pretty much eat them for breakfast, lunch and dinner. From this BLT Ranch Pasta Salad, to that Zesty Chicken Salad, this Quinoa Caprese Salad and that Roasted Garlic Green Bean Salad, I love ’em all. So when I was dreaming of my next salad creation, it occurred to me that I haven’t shared a caesar salad with you. My mind kicked into overdrive and I had a brilliant idea to make this Chicken Caesar Pasta Salad, which is light, fresh and also perfect for 30 minute Thursday! If you love caesar salads as much as I do, then you’ll enjoy this tasty spin on the classic dish. 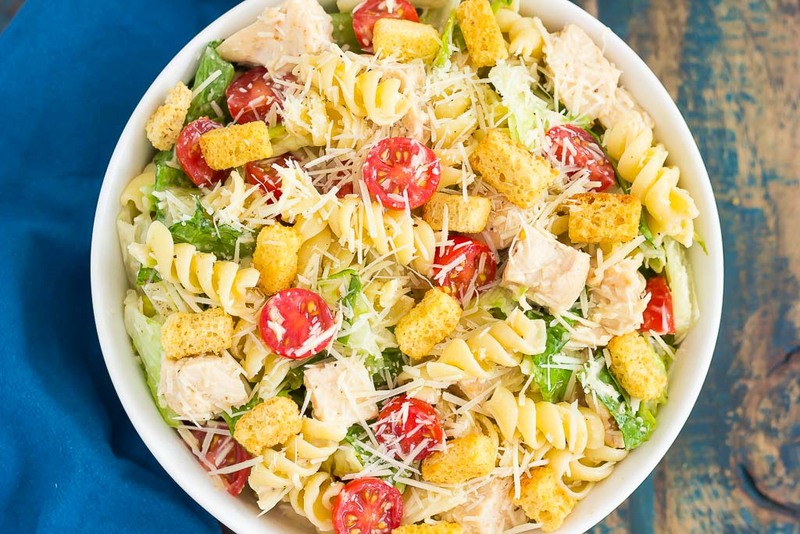 This Chicken Caesar Pasta Salad is a simple dish that’s ready in less than 30 minutes. Romaine lettuce, fresh pasta, chicken, and Parmesan cheese are tossed in a creamy caesar dressing that’s full of flavor. Light, yet filling, this easy dish makes a delicious weeknight meal! If you haven’t tried pasta in your caesar salad yet, then you’re totally missing out. There’s just something about the crunch of the lettuce and the heartiness from the pasta that makes this salad extraordinary. And the dressing, man oh man, do I love caesar dressing! I used a store-bought kind, but feel free to use a homemade version if you’d rather do so. Throw in some grilled chicken, cherry tomatoes, Parmesan cheese, and croutons, and you have a fresh dish that’s easy to make during a busy weeknight. 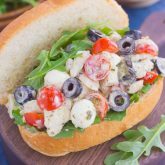 This Chicken Caesar Pasta Salad is also perfect for those barbecues and summer get-togethers. Simply make everything ahead of time, but wait to add the dressing until you’re just about ready to serve the salad. That way, the lettuce will stay fresh and not wilt as fast. And did I mention how easy this Chicken Caesar Pasta Salad is to prepare! So easy, guys! It’s almost a one bowl dish, minus the pasta part. And that’s why this fresh salad gets five gold stars in my book. 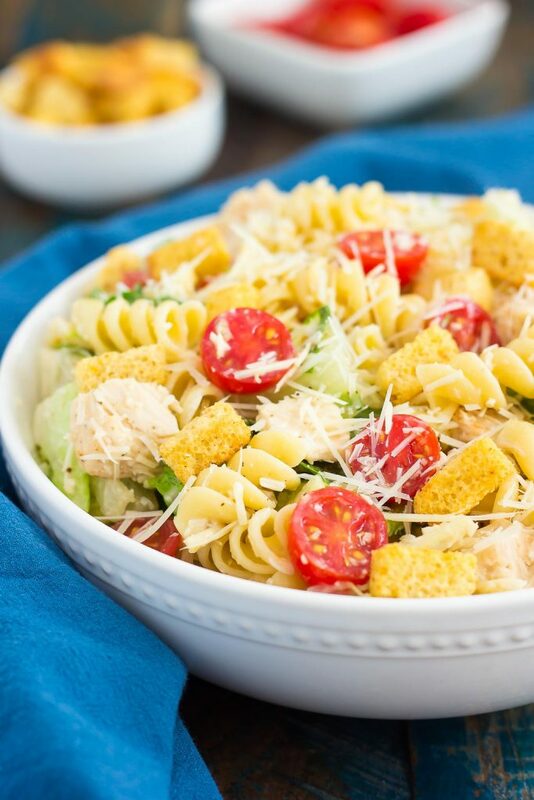 So if you’re on the hunt for that perfect summer salad that also doubles as a quick meal, then this Chicken Caesar Pasta Salad was made for you! 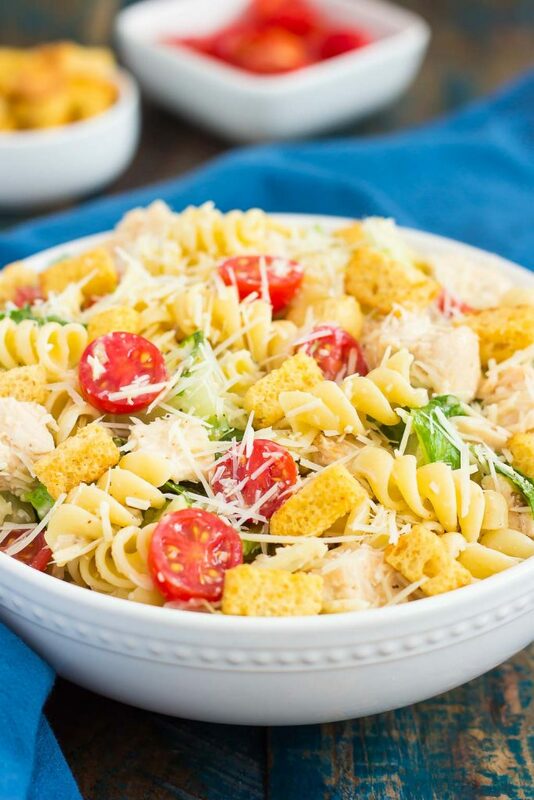 This Chicken Caesar Pasta Salad is a simple dish that's ready in less than 30 minutes. Romaine lettuce, fresh pasta, chicken, and Parmesan cheese are tossed in a creamy caesar dressing that's full of flavor. Light, yet filling, this easy dish makes a delicious weeknight meal! Cook pasta according to package directions until al dente. Drain and immediately rinse in cold water. Set aside. In a large bowl, add the lettuce, chicken, tomatoes, Parmesan cheese, and pasta. Toss with dressing. Add black pepper (if desired), croutons, and more Parmesan cheese, if necessary. This salad can be prepared ahead of time, if needed. Simply make salad as instructed, but add the dressing right before serving. Cilantro Lime Grilled Shrimp Salad from Bake.Eat.Repeat. Yum!! This one looks absolutely delicious!! I love caesar salad so I know I will be gobbling up this pasta in no time! Thank you, Ami! This salad is one of my favorites! This salad looks to die for, Gayle! I absolutely love your idea of adding pasta to Caesar salad. Brilliant! Can't wait to try it out ????. Thanks, Annie! It's such an easy dish to make! Oh wow. What a great mashup! It's got all the good stuff and is SO summery. I'm definitely making this one! Oh boy! Does this look awesome, Gayle! I've never had a salad like this before with the lettuce combined with the pasta with all the delicious flavours of caesar dressing and chicken. I'm loving that this is such a quick salad to put together and that it is completely satisfying to eat as a meal. Mind kinda salad. I'm really looking forward to trying your caprese salad and now this one is added to the list :) Pinning! Have a wonderful weekend, friend! Thank you for the kind words and pin, friend! It's such a wonderful mashup of salad and pasta, right? :) Hope you love this if you try it! Nice cool salads and super fast suppers are two of the best things ever! Pinning this one, as it is supposed to be 90+ degrees for, well, forever. I feel like the heat might just last forever, too! Thanks, Kate! It has been SO hot lately, but I'm trying not to complain, because it won't last long! Thanks for the salad love, Liz! Mmmm, this sounds so tasty! Quick and easy, too! Thanks for the kind words and for stopping by, Natalie! Thank you for this easy-to-prepare and delicious recipe! It's perfect for summer. Mmm this looks delicious! I am a huge Caesar salad fan, but have yet to try it in pasta form. I've been trying to decide what to make for dinner tonight and I thought of salad! This looks awesome and since I have all ingredients necessary, I'll try it! Pinning, too! It's so good, Mira! I think you'll love it if you try it! :) Thanks for the kind words and pin! simple and easy, this is my kind of dinner! looks yum Gayle! Thanks for the kind words, Blair! I can't believe it's July already too! Love this delicious pasta salad, Gayle! It's perfect for barbecues and totally screams summer! Thank you for the pasta salad love, Kelly! I love that you added pasta to caesar salad, Gayle! This looks so light and fresh for summer! This is the mashup of my dreams! Chicken Caesar salad and pasta combined is the best thing ever! My favorite green salad pasta style?? I'm so onboard with this!! 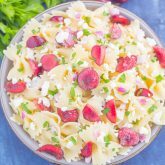 Pasta salads can just be so boring in the summertime and you definitely brought the FUN to this gorgeous salad, Gayle! This needs to be at all my cookouts from here on out! Thank you, Sarah! This salad is definitely a step up for the regular kind! I have seen pasta in caesar salad before but I've never tried it. Clearly I need to soon! My kids would love this, they're crazy for both pasta and Caesar salad so I definitely need to try it soon! Thanks, Stacey! Hope you love this if you try it! I love a good pasta salad and this Caesar inspired one is such a great idea, Gayle! This is such a fun mash-up of two of my favorite things and I love the colors and textures with the croutons and lettuce! 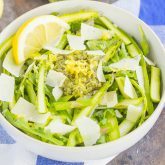 I'm a huge lover of Cesar Salad so I'm loving this recipe! 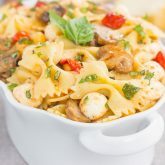 Love that you added some pasta and other fun flavors to this recipe. It's so hot here, so this is the perfect dinner/lunch.